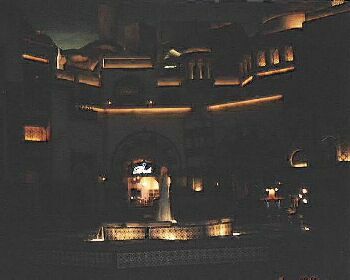 update 2007- the Aladdin is now referred to as PLANET HOLLYWOOD and has undergone major transformations. The ALADDIN is located on Las Vegas Boulevard just south of PARIS. 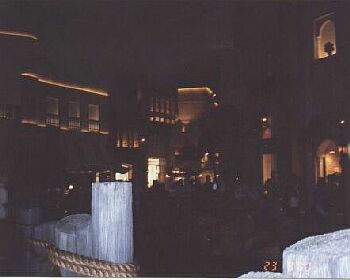 The new Aladdin was opened in August, 2000. 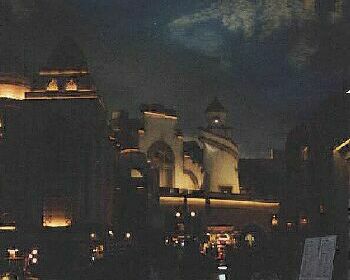 At the front of the resort is Aladdin's palace sitting on top of a mountain. A waterfall cascades down the mountain. The original Aladdin, built in 1966, was imploded on April 27, 1998. It was the first resort in Vegas to rebuild and keep the original name. 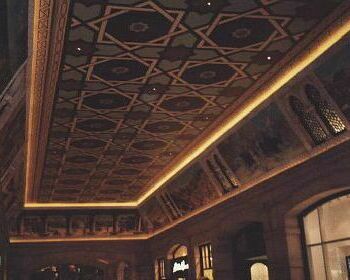 THE CASINO - (Arabian Nights theme) There are flying carpets, magic lamps, winged horse sculputures and murals throughout the casino area. DESERT PASSAGE - As you enter through the Morocco Gate or the India gate, you are transported to the open-air markets of Morocco, Arabia and India (including the music). Wander through the Lost City, Sultan's Palace and Harbor Village. At the Harbor there is a floating freighter. Here you can experience fog, a thunderstorm and showers indoors. I appologize for the dark photos. the Desert Passage without success.